Take the guesswork out of vocal mixing and give your vocal track professional clarity and polish with Nectar Elements, iZotope's newest mixing plug-in. Get everything you need for pro vocals in seconds with six under-the-hood audio processors and intuitive controls. 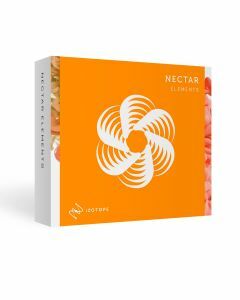 Nectar Elements intelligently combines our latest DSP for - compression, de-essing, tonal and subtractive EQ, pitch correction, and reverb into one easy-to-understand interface. Select between three distinct Vibe modes (Modern, Vintage, or Dialogue) to tell Nectar Elements what kind of sound you're going for. Get an aggressive lead vocal that cuts through a rock mix, warm background vocals for a jazz arrangement, or beautiful dialogue for podcast. No matter what style you're working in, Nectar Elements always knows what to do.